While golf seems to be the official sport of telecom, we wanted to take a slightly different approach to the intersection of work and play — introducing the Acuity Technologies CCS race team! This is the first year racing, so we won't be winning any championships, but it's a fun way to give our partners and clients an experience not everyone can have. As we go through the season, look for email invites to come out to the races and experience it firsthand. I'll also be posting photos and updates on the events as they happen. 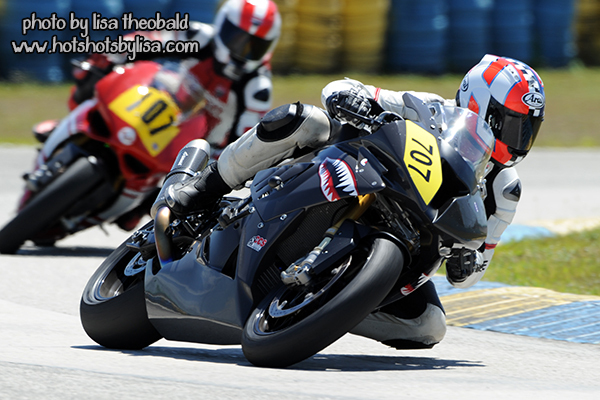 CCS stands for Championship Cup Series, and it's a club-level motorcycle road racing organization. That means anyone with a race license and an approved motorcycle can show up and race. Races are split into classes and skill levels to ensure races are competitive. We're racing in the amateur level in GTO, Unlimited GP, and Unlimited Superbike. Who's doing the racing and what are you riding? Right now it's just me (#606) and Logan Dickinson (#707), our Channel Development Manager focused on AT&T services. We're both on BMW S1000RRs, which are 193hp 1000cc bikes. We're in the CCS Florida and CCS Southeast series, so we race primarily at Homestead-Miami Speedway (FL), Daytona (FL), Jennings GP (FL), Roebling Road (GA), Carolina Motorsports Park (SC), and Virginia International Raceway (VA). Are you crazy? Is this even safe?? Well, in my opinion it's safer than riding a motorcycle on the street, but that's largely because it's a controlled environment with a very heavy emphasis on safety. We wear full armored leathers, additional back and check protectors, special boots and gloves, and I also have an airbag vest that will inflate during a wreck to stabilize the head and neck and to protect the ribs and tailbone. On top of that, the bikes we race have lots of traction-management electronics to protect us from electronics. That's awesome! How can I participate? There are races almost every month of the year, so if you're close to any of the tracks listed above, contact us and let us know you want to experience it. We'll host food and drinks in the paddock and you'll be able to get a ringside seat for the race.